Music is part of the human fabric. It exists within all cultures. It brings joy, celebration, and soothes our souls. During the fur trade era, music was enjoyed most everywhere; on the trail, in the camps, forts and trading posts. In this painting, a gentleman sporting his best and cleanest outfit, provides the post occupants with some Sunday morning “fiddlin” music. 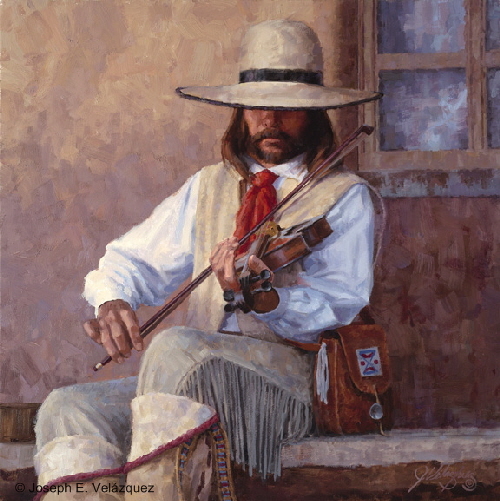 A wide variety of instruments could be heard on the frontier include the banjo, tambourine, tin whistle, Jew’s harp, drum, spoons and triangle. The fellow in the painting is a real person, a real musician, and an all-round talented guy named Rex Rideout. He performs at many historically-themed events and made his acting debut in the movie “Cowboy and Aliens”.